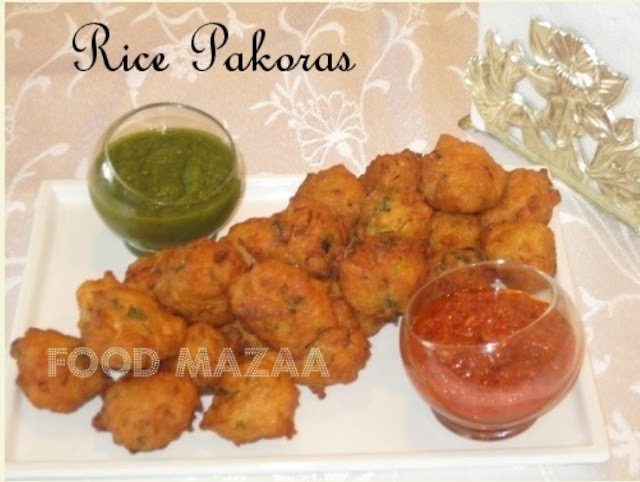 We usually make use of the left-over rice by making lemon rice, tamarind rice etc etc..I came across this recipe of making pakoras out of it in my dear friend Meena's Blog, Homely Food. Today I tried it out and here is the recipe. 3. Drop a spoonful of batter and fry the pakoras. 4. Serve the crispy pakoras with chutney / sauce. Meena, I have added curd too but forgot to mention in the ingredients.. thanks for reminding me dear..
Nice innovation ! Thanks Shobha and Meena! Plz pass me some !!! Wow yummy and different taste pakoda. wow i want to grab them from the screen,yummy!!! yummy and tempting pakoras...nice tea time snack. Pakora looks crisp and very inviting, like to bite few now. Delicious and creative crisp snack looks yum. This so crisp and yum yum. wud love to grab this platter with my coffee. Love to finish that whole plate rite now,irresistible and seriously tempting fritters. Yummy n mouthwatering! !its difficlut 2 find gram flour here.